Kulpmont - It is with great sadness that the family of Gerald Getty announces his passing at the age of 83, on Friday, April 12th, 2019 in his home in Den Mar Gardens. Born on September 10, 1935 at home in Centralia, Gerry was a lifelong resident there before moving to Den Mar Gardens in 1986. He graduated in 1953 from Con-Cen High School in Aristes, PA.
On May 2, 1959, Gerald married the former Pauline Fedorko who survives. They were married in the Grace Lutheran Church in Shamokin by the late Reverend Robert Arentz. They would have been married 60 years on May 2 of this year. Gerald worked as a mechanic for Yarworth’s Service Station in Centralia. He then went on to operate the Ashland Service Center in Ashland for 47 years until his retirement in 2002. Gerald was a former member of the Centralia United Methodist Church, where he served on the Administration Board. 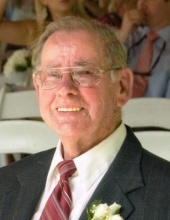 Most recently, he was an active member of the First United Methodist Church in Mount Carmel. Those who knew Gerald knew that he was too stubborn to allow a kidney transplant in 1990 and various heart complications from doing the things he enjoyed, such as attending his granddaughters‘ extracurricular events, hosting family gatherings, and showing off his extensive model train display. He was always the life of the party with his jokes and he was happiest when he was with his family. Gerry will be lovingly remembered by his wife, Pauline; his son, Bret Getty and his ﬁance Diane Rompallo; his daughter, Deidre Hughes and her husband Don Hughes. Gerald will also be fondly remembered by his ﬁve granddaughters, Shauna Blee and her husband Ryan, Amber Latorre and her husband Michael, Kaitlynn Brown and her husband Troy, Taylor Getty and Cameron Getty. Gerald also greatly enjoyed the company of his three great-grandchildren, Jarrett Blee, Carson Latorre, and Ariel Brown. He is also survived by his brother Donald Getty and his wife Sandra; and his sisters, Eleanor Searls and Beverly Weikel. He was preceded in death by his parents, George and Bessie (Wills) Getty; his brother, Earl Getty; sisters, Miriam Kuziak and Jean Fisher; and his grandson, Jarrod Hughes. To send flowers or a remembrance gift to the family of Gerald Getty, please visit our Tribute Store. "Email Address" would like to share the life celebration of Gerald Getty. Click on the "link" to go to share a favorite memory or leave a condolence message for the family.